3 Puzzle Lapel Pin Badges. 3 Steam Punk girl band. Redhead with microphone, blond with guitar, green haired pale skin sitting on drum. All 3 in front of brick wall with gears. Limited Edition of 150 of Each Made! Copper base metal pins are about 3.25" x 3". 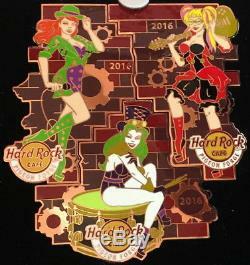 This COOL Pin Set is a great LIMITED addition to your Hard Rockin' Pin condition! 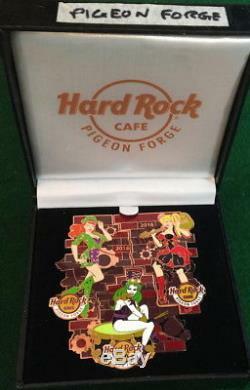 The item "Hard Rock Cafe PIGEON FORGE 2016 Steam Punk Girl Band 3 PIN Set BOXED HRC #91364" is in sale since Monday, June 25, 2018. This item is in the category "Entertainment Memorabilia\Music Memorabilia\Rock & Pop\Artists H\Hard Rock Café\Pins".